According to the results of the 2014 National Survey on Drug Use and Health, of the 21.5 million Americans ages 12 and older who had a substance use disorder in 2014, 586,000 individuals had a problem involving heroin. What exactly is heroin? The drug heroin is an opioid substance derived from the same type of poppy plant that is used to produce similar drugs such as morphine. These types of drugs have been used to treat pain for over a century. Heroin, originally marketed in the U.S. by the Bayer pharmaceutical company in 1898, was to be used in place of morphine. It was heavily promoted as being non-addicting and, therefore, an excellent treatment for morphine addiction. By 1924, it was outlawed for both medical and illicit use as there was overwhelming evidence that the drug was a dismal failure and had become a blight on society. Opioids produce a feeling of euphoria that is highly addictive, leading the user to seek the feeling over and over. People have reported intense feelings of perfect peace and comfort from using heroin. Heroin is not only emotionally addictive, but also physiologically (physically) addictive, making its grip on users exceedingly strong. Heroin can come in several forms, including a brownish-black tarry substance or a white or brownish powdery substance. In addition, heroin can be used in several different ways. It can be injected with a needle directly into the vein, under the skin, or into the muscle. Heroin can also be smoked or snorted. While some methods of use can cause quicker physical damage, heroin is just as addictive no matter how it is used. 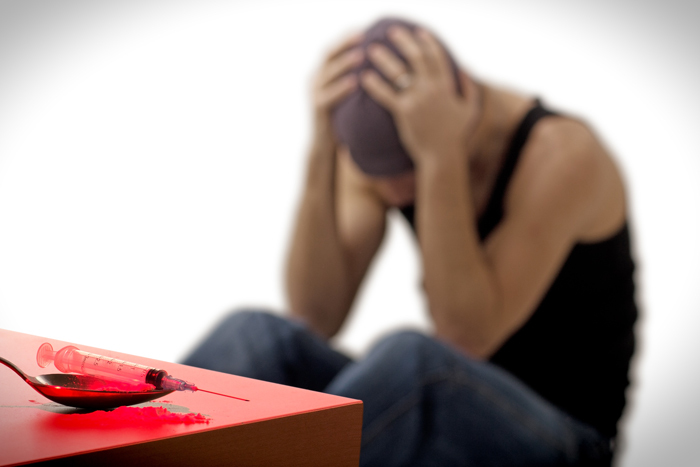 What are some signs of heroin addiction? Regardless of how long a person has been using heroin, there will be some tell tale signs, especially when a person crosses over into full blown addiction. Some of these signs are physical and some of them are behavioral. Heroin can make the user itchy, much like morphine does. Pupils become pinpointed (very small). The user can become nauseated and may vomit from using the drug, as well as while withdrawing from it. Heroin users and addicts become extremely constipated and often need laxatives to feel comfortable. The user may have skin infections or other infections from a compromised immune system. You may notice bruises and swollen areas on the person’s arms, legs, and other body parts from injecting heroin. You might find needles, pieces of foil, lighters and spoons, pipes, etc. either hidden or out in the open. The user may begin committing criminal acts, such as stealing, to sustain their habit. If you are concerned about someone you know and believe they are showing signs of heroin addiction or heroin use, please reach out for professional help. Recovery is possible and heroin is a dangerous drug that often leads to accidental overdose. Consider reaching out today; you may save your loved one’s life. To learn more about the signs of heroin addiction or to get help for you or a loved one, please contact Twin Lakes Atlanta heroin detox center today at (877) 958-0778. Opioid Addiction 2016 Facts & Figures. (n.d.). Retrieved January, 2017. Heroin History 1900s Part 2. (n.d.). Retrieved January, 2017.